Files you open in Photoshop Elements are composed of millions of tiny, square pixels. Each pixel has one, and only one, color value. The arrangement of the pixels of different shades and colors creates an illusion to your eyes when you’re viewing an image onscreen. For example, you may have black-and-white pixels arranged in an order that creates the impression that you’re looking at something gray — not at tiny black-and-white squares. Making pixels darker or lighter to change contrast and brightness. An image made of pixels is called a raster image. If you open a file in Elements that isn’t made of pixels, you can let Elements rasterize the data. In other words, Elements converts other data to pixels if the document wasn’t originally composed of pixels. To use most of the tools and commands in Elements, you must be working on a raster image file. If your data isn’t rasterized, many tools and commands are unavailable. The pixels in an image determine an image’s resolution and dimensions. If you have 300 pixels in 1 inch, your image resolution is 300 ppi. If you have 72 pixels across a 1-inch horizontal line, your image resolution is 72 pixels per inch (ppi). Printing images: The optimal resolution for print is 300 ppi. If the image resolution is too low, the image prints poorly. If the resolution is too high, you waste time processing all the data that needs to be sent to your printer. Showing images onscreen: The best resolution for onscreen images is 72 ppi. Onscreen resolution is lower than print to match typical screen resolutions (also called display resolution). Just as images have resolution inherent in their files, your computer monitor displays everything you see on it in a fixed resolution. Computer monitors display images at 72 ppi (or 85 or 96 ppi or higher). That’s all you get. What’s important to know is that you can always best view photos on your computer monitor at a 72-ppi image size in a 100 percent view. Newer devices such as smartphones and tablets have screens with higher resolutions. You can find device display resolutions from 150 ppi to over 300 ppi on a variety of devices. When you design for different displays, it’s important to know the device display-resolution capabilities before you start working in Elements. 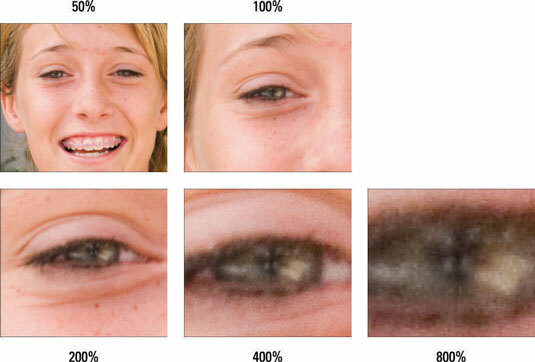 To see how image resolution and screen resolution combine and impact what you see onscreen, take a look at this figure. You see an image reduced to 50 percent and then at different zoom sizes. When the size changes, the monitor displays your image at different resolutions. For example, if you view a photo with a resolution of 72 ppi and reduce the size to 50 percent view on your monitor, the resolution on the monitor appears as though the photo is at 144 ppi. When the size is 100 percent, the image resolution is the same as the monitor resolution. The table provides a closer look at these differences in resolution. monitor but not on paper. the monitor can display only 72 ppi. This relationship between the image resolution and viewing the image at different zoom levels is an important concept to grasp. If you grab an image off the web and zoom in on it, you may see a view like the 800 percent view shown in the figure. If you acquire a digital camera image, you may need to zoom out to a 16 percent view to fit the entire image in the image window. The reason that these displays vary so much is because of image resolution. That image you grabbed off a web page might be a 2-inch-square image at 72 ppi, and that digital camera image might be a 10-x-15-inch image at 240 ppi. To fill the entire window with the web image, you need to zoom in on the file. When you zoom in, the image appears as though it is reduced in resolution. When you zoom into or out of an image, you change the resolution as it appears on your monitor. No resolution changes are made to the file. The image resolution remains the same until you use one of the Elements tools to reduce or increase the image resolution.